The growing water scarcity in Jordan is managed through a combination of supply- and demand-driven approaches. The demand-driven approach (also called demand management) implements water-saving measures, reducing demand for water from the source. Technical measures, such as the repair of leaking water pipes in a distribution network and the use of perforated tubing for crop irrigation (drip irrigation) will result in water savings. Legal, administrative and financial measures can also help reduce demand. Setting a price for water, for instance, will make people more cautious in their use of water. Demand management approaches emphasize economic and social aspects of water use to a greater degree than supply management approaches do. This requires strategies that take into account societal needs and perspectives, and address public perceptions and individual behaviours. Effective policies, politics and programmes are key. This also means that, to be widely accepted and consistently applied, demand management strategies have to address public concerns regarding water access equity and good environmental stewardship. Raising public awareness of the growing water crisis and engaging Jordanian citizens in water conservation continues to form a major challenge for the government. As water scarcity has been part of life in Jordan for several decades, many Jordanians are not aware of the scope or severity of the problem. This is why education is important – not only to teach methods of water conservation but also to explain why it is so important. The 2008 National Water Strategy established a number of goals and measures to raise awareness of water scarcity and involve the Jordanian population in ways to mitigate its impact. The main international donors (USAID, GIZ, SIDA, etc.) have also funded and prepared a number of awareness-raising campaigns that targeted different sectors of Jordanian society such as schools, households and communities as well as major cities. For example, in February 2015, the US government provided a grant to the Jordanian government to launch a public awareness campaign in the Zarqa Governorate, in conjunction with water and sewage projects overseen by the Ministry of Water and Irrigation. The campaign slogan, “By Water We Live – We Preserve it to Survive”, encourages people to save water at home through a series of water-saving practices. In addition, water scarcity and demand-management concepts and practices have been introduced into school curricula in order to educate schoolchildren on the critical needs and practical responses available. Education at the technical level (plumbers) and at the university level (a Master’s degree in Water Demand Management) has also been implemented. 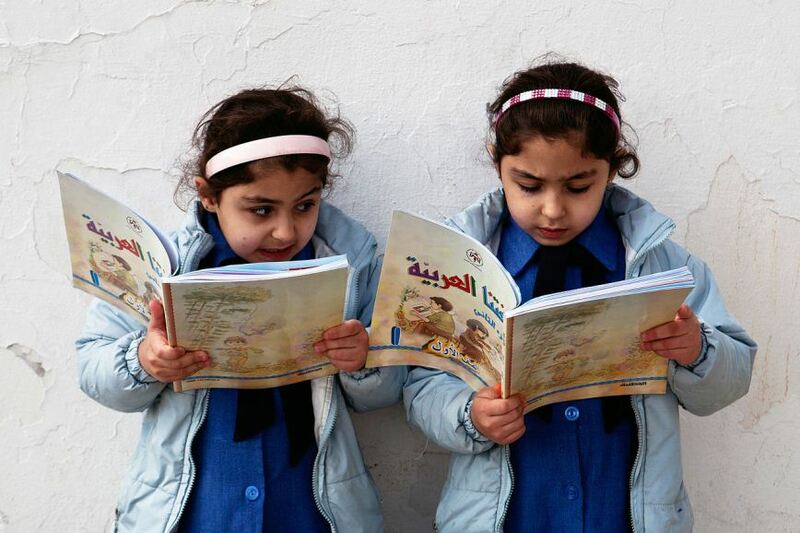 Young girls reading at a government primary school in Amman. Photo: Tanya Habjouqa. Abdel Khaleq, R., 2008. Water Demand Management in Jordan.